Prof. Aren M. Maeir is a professor of archaeology in the Martin (Szusz) Department of Land of Israel Studies and Archaeology at Bar Ilan University. 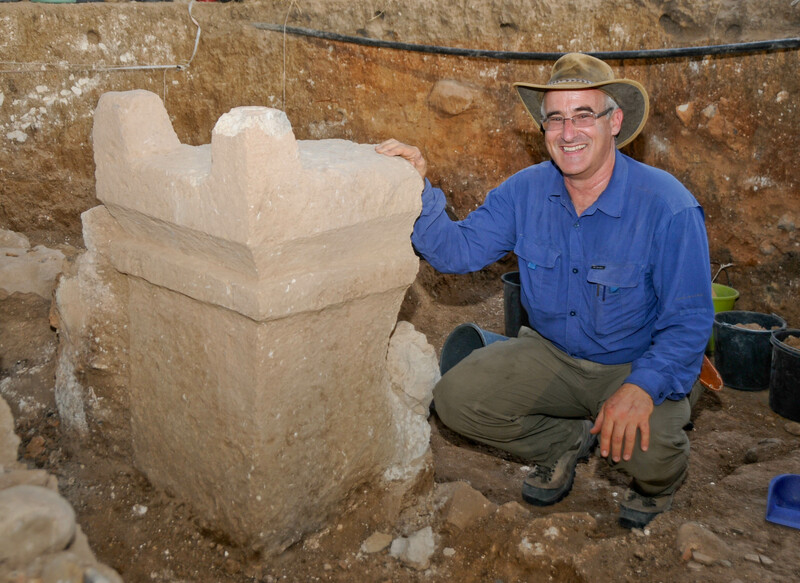 Since 1996, he has directed of the Ackerman Family Bar-Ilan University Expedition to Gath, one of the primary and largest archaeological projects in the Near East. He serves as co-editor of the Israel Exploration Journal, and is a corresponding member of the Deutsche Archäologische Institut. His research focus involved: Bronze and Iron Age cultures of the ancient Near East, with particular focus on the Canaanite, Philistine, Israelite, Judahite and Aramaean cultures; Interconnections between the Southern Levant and other parts of the ancient Mediterranean world; The interface between archaeology and text; Interdisciplinary research in archaeology; Enthoarchaeology of Papua New Guinea. * Galil, G., Gilboa, A., Maeir, A. M., and Kahn, D., eds. 2012. The Ancient Near East in the 12th-10th Centuries BCE: Culture and History. Proceedings of the International Conference held at the University of Haifa, 2–5 May, 2010. Alter Orient und Altes Testament 392. Münster: Ugarit-Verlag. * Maeir, A. M. 2004. Bronze and Iron Age Tombs at Tel Gezer, Israel: Finds from the Excavations by Raymond-Charles Weill in 1914 and 1921, with contributions by N. Panitz-Cohen, D. Barag, O. Keel, N. Applbaum and Y. Applbaum. British Archaeological Reports International Series 1206. Oxford: Archaeopress. * Maeir, A. M., ed. 2012. Tell es-Safi/Gath I: Report on the 1996-2005 Seasons. Wiesbaden: Harrassowitz (Biblical Archaeology Society, Best Scholarly Publication Award, 2013). * Maeir, A. M., and Uziel, J., eds. In press. Tell es-Safi/Gath II. Münster: Ugarit-verlag. * Ackermann, O., Greenbaum, N., Ayalon, A., Bar-Matthews, A., Boaretto, E., Bruins, H., Cabanes, D., Horwitz, L. K., Neumann, F., Porat, N., Weiss, E., and Maeir, A. M. 2015. Using Palaeo-Environmental Proxies to Reconstruct Natural and Anthropogenic Controls on Sedimentation Rates, Tell es-Safi/Gath, Eastern Mediterranean. Anthropocene. * Ben-Shlomo, D., Shai, I., Zukerman, A., and Maeir, A. M. 2008. Cooking Identities: Aegean-Style and Philistine Cooking Jugs and Cultural Interaction in the Southern Levant during the Iron Age. American Journal of Archaeology 112: 225-46. * Hitchcock, L. A., and Maeir, A. M. 2014. Yo-Ho, Yo-Ho, a Seren’s Life for Me! World Archaeology 46(3): 624–40. * Hitchcock, L. A., Horwitz, L. K., Boaretto, E., and Maeir, A. M. 2015. One Philistine’s Trash is an Archaeologist’s Treasure: Feasting at Iron Age I, Tell es-Safi/Gath. Near Eastern Archaeology 78(1): 12–25. * Maeir, A. M. 2012. Philistia and the Judean Shephelah After Hazael: The Power Play Between the Philistines, Judeans and Assyrians in the 8th Century BCE in Light of the Excavations at Tell es-Safi/Gath. Pp. 241–62 in Disaster and Relief Management – Katastrophen und ihre Bewältigung, ed. A. Berlejung. Forschungen zum Alten Testament 81. Tübingen: Mohr Siebeck. * Maeir, A. M. 2013. Review of: A. Faust. 2012. The Archaeology of Israelite Society. Eisenbrauns: Winona Lake, IN. Review of Biblical Literature. * Maeir, A. M. 2009. Hazael, Birhadad, and the Ḥrẓ. Pp. 273–77 in Exploring the Longue Durée: Essays in Honor of Lawrence E. Stager, ed. J. D. Schloen. Winona Lake, IN: Eisenbrauns. * Maeir, A. M. 2015. Micro-Archaeological Perspectives on the Philistine Household throughout the Iron Age and Their Implications. Pp. 307–19 in Household Studies in Complex Societies. (Micro) Archaeological and Textual Approaches, ed. M. Muller. Chicago: Oriental Institute of the University of Chicago. * Maeir, A. M. 2015. A Feast in Papua New Guinea. Near Eastern Archaeology 78(1): 26–34. * Maeir, A. M. In press. The Aramaean Involvement in the Southern Levant: Case Studies for Identifying the Archaeological Evidence. In In Search of Aram and Israel: Politics, Culture and Identity, eds. O. Sergi, M. Oeming and I. de-Hulster. Oriental Religions in Antiquity. Tübingen: Mohr-Siebeck. * Maeir, A. M., Davis, B., Horwitz, L., Asscher, Y., and Hitchcock, L. 2015. An Ivory Bowl from Early Iron Age Tell es-Safi/Gath (Israel): Manufacture, Meaning and Memory. World Archaeology 47. * Maeir, A. M., and Gur-Arieh, S. 2011. Comparative aspects of the Aramean Siege System at Tell eṣ-Ṣāfi/Gath. Pp. 227–44 in The Fire Signals of Lachish: Studies in the Archaeology and History of Israel in the Late Bronze Age, Iron Age and Persian Period in Honor of David Ussishkin, eds. I. Finkelstein and N. Na’aman. Winona Lake, IN: Eisenbrauns. * Maeir, A. M., and Hitchcock, L. 2011. Absence Makes the Hearth Grow Fonder: Searching for the Origins of the Philistine Hearth. Eretz Israel 30: 46*-64*. * Maeir, A. M., Wimmer, S. J., Zukerman, A., and Demsky, A. 2008. A Late Iron Age I/Early Iron Age IIA Old Canaanite Inscription from Tell eṣ-Ṣâfī/Gath, Israel: Palaeography, Dating, and Historical-Cultural Significance. Bulletin of the American Schools of Oriental Research 351: 39–71. * Namdar, D., Zukerman, A., Maeir, A. M., Katz, J. C., Cabanes, D., Trueman, C., Shahack-Gross, R., and Weiner, S. 2011. The 9th Century BCE Destruction Layer at Tell es-Safi/Gath, Israel: Integrating Macro- and Microarchaeology. Journal of Archaeological Science 38(12): 3471–82.